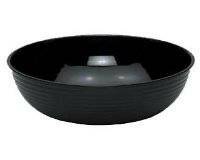 Zanduco offers a large selection of Camwear Polycarbonate bowls, in both round pebbled and ribbed styles. These stylish and contemporary styles of bowls are ideal for homes, cafes, restaurants, delis and more! Made of virtually unbreakable polycarbonate material, these bowls are aesthetically pleasing as well as durable and lightweight, perfect for long time use and extensive washing. Fill to the brim with salad, pasta, fruit, vegetables and more! Extremely versatile, choose the style and size that will be best for your establishment! Use the proper serving equipment, like Zanduco’s polycarbonate utility tongs! Not what you are looking for? Mixing bowls and a variety of other styles available here.